Reginald Josiah Thomas Evan was born in January 1888, a month after his father died. He was educated at the Spurgeon Orphanage in London and then served an apprenticeship at the Gade Brush Factory of GB Kent and Son Ltd, Apsley, whilst living with his mother and brothers in Broad Street, Hemel Hempstead. 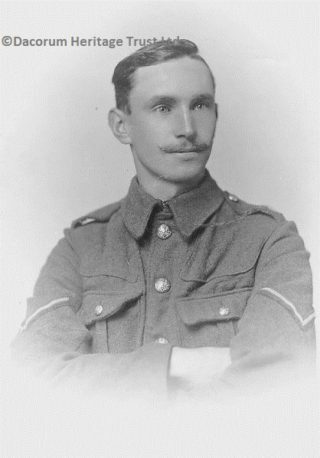 He joined the Herts Territorial in 1913 and when war was announced a year later, he was the first man to sign up at the Drill Hall. In October 1915 Corporal Evans was awarded the DCM for a moonlight reconnaissance. Reg wrote a letter that they needed a volunteer to go out that night and report what damage has been done to the enemy’s wire and front trenches by the intensive bombardment. The artillery would receive orders to cease fire for an hour or so whilst the reconnaissance was carried out but so as not to raise suspicions at the lull, machine guns would carry on covering fire over the German lines. Whoever took the job on would have to go alone. It would probably mean death but would certainly mean glory’. Thankfully, Reg succeeded in his mission: ‘The state I was in when finally I did reach out trenches can be imagined. Challenged by a sentry, I was almost too exhausted to reply. Plastered with mud and clothing literally in sheds I was almost unrecognisable even by men of my own Company. After making my report I found an old dugout where I was only too glad to turn in and sleep. I had been out over an hour longer than was intended and been given up for lost, hence the recommencent of the bombardment, which so nearly caused my death. A personal letter from the General commanding the brigade was handed to me next morning, thanking me for the reconnaissance made and the report sent in and when after a few days, news came through that I had been awarded the D.C.M. I felt that I should need the attraction of a whole barrow-load of decorations before undertaking another expedition of the same kind. 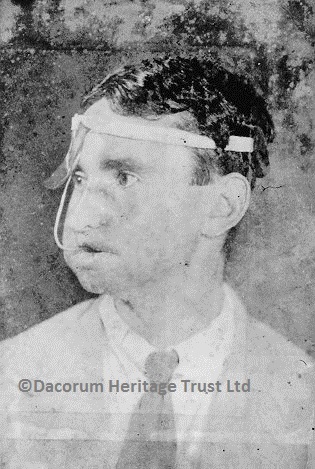 The following year, in 1916, Reg was badly wounded in the face and underwent pioneering plastic surgery performed by the eminent surgeon, Capt. H.D Gillies at a hospital in Aldershot. Evans, by now a sergeant, made a remarkable recovery and took part in the British Expeditionary Force’s campaign in Russia against Lenin’s Bolsheviks of 1918-1918. 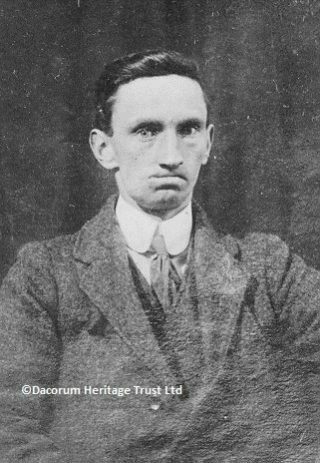 After the war, Reg found it difficult to resume his civilian life back in Hemel Hempstead and went to live in Armitage, Staffordshire, where his mother originated. He married Eva Walker in 1924 and they had four children-Bill, Mary, Pamela and another son who died as an infant. He ran a newsagents in Armitage and also served as a parish clerk, Secretary of The British Legion and was in the Home Guard during the Second World War. He died in 1943 and is buried in Armitage Churchyard. A truly remarkable man. This page was added on 08/07/2011. Before the days of team building . . .
Can you suggest a bubble caption? Dressing to impress is not a new concept! Help - Does anyone know what this is?